A perfect and affordable addition to your Halloween gathering. Our 16 ounce Styrofoam Halloween party cup packs are available in 10 count sleeves. Each sleeve is tied with coordinating ribbon, so they are all ready to give as a gift. Please note, we can’t personalize 10 count packs. The smallest order we can personalize is 50 cups, but we can replicate this design and put personalization on the other side of the cup or add it somewhere to the design you see. We love looking at creative party foods. If you’re gonna whip out the grill for your Halloween party then try this fun idea! 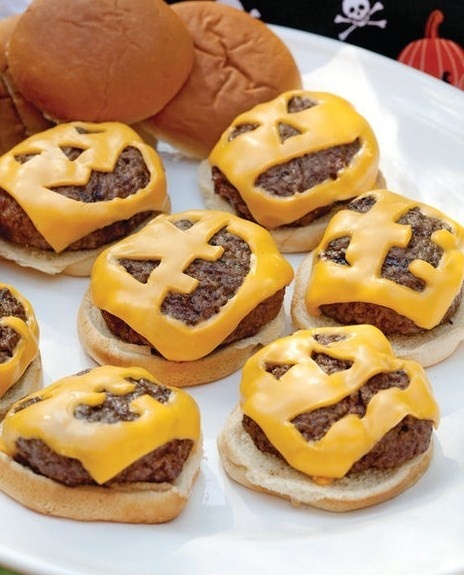 Melt the cheese on your burgers to look like fun or scary jack-o-lantern faces! Your guests and family are sure to get a kick out of this one! Halloween goodies never looked so cute! Perfect for sticking onto goodie bags, candy boxes, lollipops, candy bars, a sleeve of styrofoam cups. Leave it to Martha Stewart to come up with ideas on how to carve a pumpkin creatively. These gallery of Halloween-themed pumpkins is for sure to knock your socks off. Our personalized personalized Halloween candy bags for kids are the cutest bags around. Made of polyester, these 12” L x 5” W x 12” H are made of polyester and come with long and easy to carry handles. Get your treats home in a cute and personalized way as these bags can be customized with a name or monogram using our cute fonts and thread colors shown below. However you spent your Halloween, be safe and have fun!